Are you working for Operations? Have you ever come across a situation where you are not in sync with the Dev and the QA team when it comes to the status of issue fixation? Were you ever provided with incorrect status updates on the latest issues that cropped up in a production environment? Did your project get delayed because of lack of communication between teams? If so, then, can you imagine how badly your project could have been affected both in terms of ’Time’ and ’Cost’? Additionally, is not the reputation of your organization hampered because of delays in customer deliveries? Searching for a user-friendly and fully automated integration solution can be difficult. Especially, when you need to keep in mind how to properly monitor the different phases of the development lifecycle properly or manage cross-team stakeholders. Not to mention, sticking to deadlines while ensuring quality while executing a development project plan. We have got something for you! Kovair has introduced an adapter that allows you to connect to Helix ALM with bi-directional synchronization of events in real-time between third-party tools. Helix ALM from Perforce provides the capability of managing Requirements, Test, and Defect from a single window. However, there are certain phases in an Application Lifecycle that cannot be managed using Helix ALM capabilities like Build and Configuration Management. 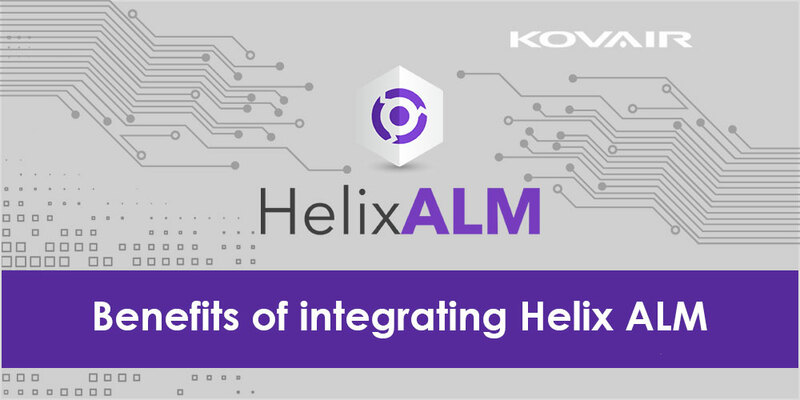 To bridge the gap and to define an end-to-end ALM system, Kovair has developed the adapter for Helix ALM that would facilitate Helix ALM to communicate with other cross-domain tools using Kovair Omnibus integration platform. This seamless integration will lead to a breakthrough of silos, better collaboration between stakeholders, improved activity tracking across different tools, and end-to-end traceability among various cross tools artifacts. 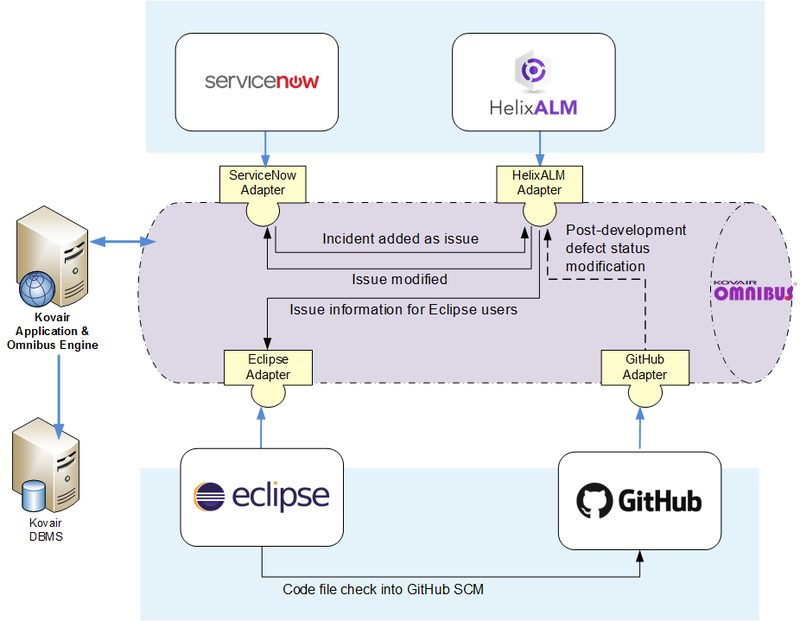 To help understand the benefits, let us take a real-life scenario of an organization where the operations team is using ServiceNow to track their incidents and the internal development team uses Helix ALM to track the defects. Let us say an issue has been identified in an application by an end user. The Operation Team member is notified when the end user informs him about the same. The Operation team member reports the Dev Team about the issue through emails/phone calls. The Developer, on the other hand, is loaded with a hundred other issues and is unable to keep a track of all the incoming issues. After some time, let’s say, the Developer starts working on it. However, the Operations member is unable to understand the current progress of the issue. Neither does he know whether the issue has been looked into. As a result of which, the Operations Member does not provide any status update to the end user leaving him to feel unattended. Now, the Developer resolves the issue but communicates the same through phone calls/ emails after a certain delay. This time, maybe Operations Team member missed the mail out of the countless emails which he receives every day. Just think about the miscommunication! The inter-team collaboration gaps, the delay for the deliveries and above all, the reputation of the organization – Don’t you think it is a bad way to deal with such stuff in this manner? The following illustration represents the above-mentioned integrated Incident Tracking process coordinated by Operations and the Development teams, facilitated by Kovair Omnibus. The end user notifies about the issue to the Operations team. The Operations Team raises an Incident in ServiceNow. The Incident is synced to Helix ALM as a Defect through Kovair Omnibus. Developers, using Helix ALM, identifies the newly added Defect and assigns an Owner to it. The Defect is updated in Helix ALM, which is automatically synced to the Incident in Service Now through Kovair Omnibus. The Operations team checks the updated status of the Incident without doing any manual communication with the Internal Development team. The Developer works on the code project from Eclipse IDE, which resides in the GitHub source control. The Developer checks out the code file from GitHub, fixes the code to resolve the reported Defect and then checks it into GitHub by providing sufficient information about the Defect and the resolution done to fix it. Next, the Developer updates the status to ‘Fixed’ in Helix ALM. In Service Now, the Incident status automatically gets updated to ‘Resolved’ through Kovair Omnibus. The Operations team notifies the end user that the Incident reported by them is resolved. No delays, no communication gaps, no error-prone manual interventions – leading to a smooth delivery! Additionally, this saves your ’Time’ by eradicating unnecessary delays as well as the final project “Cost” by engaging lesser human resources in the method. Now, you already have the idea on the need for integration with Helix and its benefits. Our main motto is to break the silos, integrate tools and bring in sync the teams that are involved. What we gain by this Helix ALM integration? Synchronizing Helix ALM tool with requirement management, test management, and defect management tools allow us to keep track of every process in the development lifecycle. Kovair-Helix Adapter enables the Helix tool to communicate with other ALM tools using the standard HELIX ALM Soap-based SDK. Real-time updates can be achieved on the status of any Helix work item and its estimated time of delivery for identifying release impediments and risks. This also helps to track delivery timelines seamlessly with concurrent updates on any Helix work item change. Collaboration among teams and departments is achieved using Helix ALM adapter with cross tool integrated reporting features. With Helix ALM adapter, one can automate traceability right from requirements capture and risk analysis through testing and defect resolution. Tracking requirement, test cases, test result, application defects, and their interrelationships including relevant fields like the ID, Title, Status, etc. is made possible. Web-based codeless configuration screens are available in case of ‘point-and-click’ configurations of integration rules. Kovair Helix ALM Adapter supports complete folder hierarchy along with the data within. The integration allows bi-directional hierarchy folder data flow. For efficient synchronization, we need to have a seamless flow of data, robust reliability mechanism, and acknowledgments for all necessary events status. Kovair, with utmost efficiency, covers all these objectives and acts as a boon for integration scenarios to achieve your goal! Interested to set up the scenario running on your mind? Catch us now at sales@kovair.com!